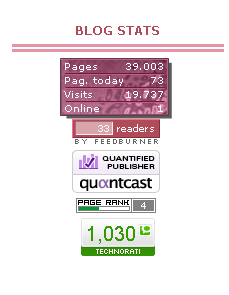 Please allow me to share with you my blog statistics as of June 17, 2008. My technorati has already reached 1000 and aside from that my blog has attained 39,000 plus page views already and about 19,700 plus unique visits. Opps! Don’t get me wrong but I am not bragging about this. If you reached such figures, you would also be happy and thankful just like me!This post is dedicated as a “thank you post” to all my regular readers, droppers and friends who continues to visit Pinay Mommy Online especially those in my blogroll. I would like to thank those who tagged me from day 1 that I started blogging especially JK who shared to me the “Big Bang” which I consider as the greatest meme that contributed not only to my technorati but also with my page rank as well (backlinks galore). I would like to thank those who participated in my previous project Project Exlinks and my on going project PEXLINK’s Triple Love that contributed much on my RSS readers and even accelerated my technorati authority. All these things will not be possible if it weren’t for all of you. So please, accept my deepest gratitude on making Pinay Mommy Online reached these blog statistics after all the problems that I encountered such as the crushing down of this blog and the ZEROing out of all it’s stats the time I bought my domain name. we should all be thankful to you too for sharing what you have. you have such a generous heart. thanks for that. wow! congrats rubs! I’m so happy for you!..you really deserve it mn gyd!